"Baked salmon makes an excellent main course!" Preheat the oven to 400 degrees F (200 degrees C). In a small bowl, mix together the mustard, butter, and honey. In another bowl, mix together the bread crumbs, pecans, and parsley. Easy to prepare and nice taste. I used walnuts instead of pecans. 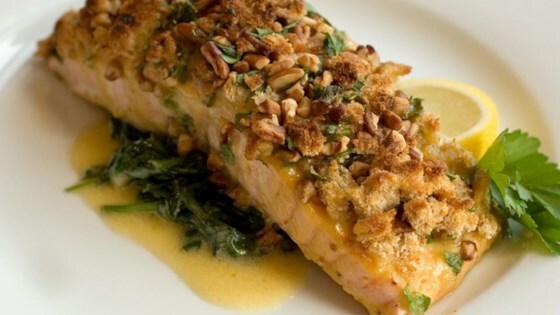 This recipe is very similar to the Baked Dijon Salmon recipe on this site as well. Fabulous! Compares to a superb salmon dinner in a seafood restaurant. We all loved it. However, I only used about half of the sauce. Will make less next time.